I came to the US in August 2017 for my MS at University of Michigan. To study in the US you have to be much more autonomous than in France due to their schooling system. 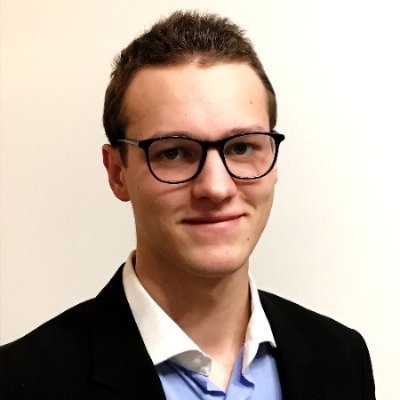 I am now working at Exa Corporation – Dassault Systèmes in Brisbane, CA, as an Aeroacoustics Engineer Intern. 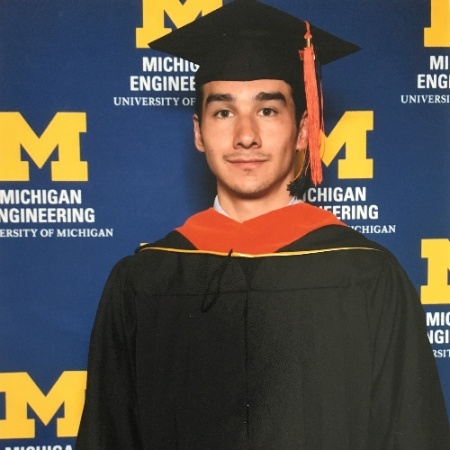 As an intern at Exa Corporation I design fluid systems on CATIA such as engine parts, exhaust bodies, HVAC systems, cooling packages, etc... and then I set up CFD simulations of PowerFLOW in order to study their acoustics and heating performances. Being a Gadzarts has brought me organizational skills as well as technical skills such as using CATIA, for example. My internship ends on February 28, 2018 and I am looking for a full-time position as an Aerospace/Mechanical Design Engineer in the US as I want to continue my American experience. I hope that Gadzarts network might be helpful to me in my work search. One of my favorite ways to spend my free time is going out with my friends exploring the city (San Francisco where I live now) and the state of California. AMAURY: Hey I’m Amaury! I’m a Li 216 alumn. I’m currently a second-year student at A&M Lille. During my spare time, I oversee the treasury part of A&M rock Club and I also sell some saucisson in my place for a very fair price. Currently, I’m working hard in the Atel’ss to finish before the end of the year our Clé d’ex. Regarding next year, I got accepted at my third-year master: CREDA which is oriented on business development and entrepreneurship. I’m really excited to do it! However, before that, I must do my and-of-studies internship, and it is an internship in NY from August to February in the Kolibree Company (they work on connected toothbrushes). Unfortunately, I still don’t have an accommodation for this stay and I’m really looking forward to finding one (and if possible with A&M alumn). Let me know if you can be of any help! AFAM: Please let us know how you were able to get your internship? 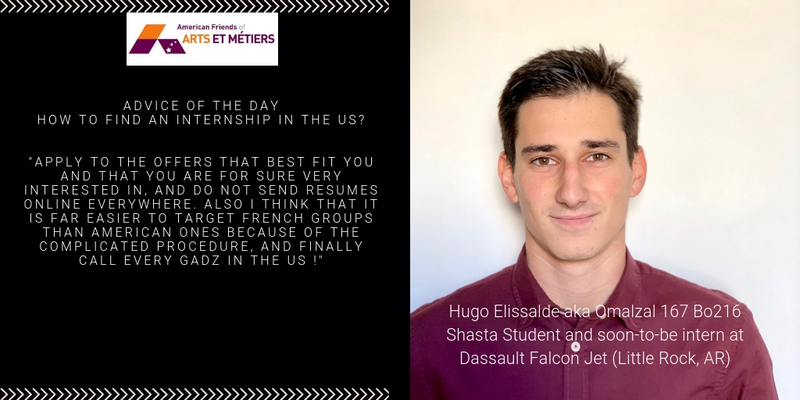 What do you expect from your future internship and from your stay in the US? AMAURY: Well, I had a lot of luck on this one. In fact, during my first year at A&M, I already did an internship at Kolibree in France for one month. It went really well and when I started to search a new internship abroad, I got in touch again with my supervisor who told me that he could help me. Indeed, Kolibree is branching out to the US and he had a perfect position for me in New York. That is why I got lucky. During my internship, I will work on business development topics and I hope to learn a lot from this experience. Indeed, we gain a vast knowledge in engineering but quite nothing on business topics. I expect to discover this field and maybe work in it after. On a personal point of view, I am willing to visit the East coast of the US (maybe not all at once) as well as getting to know the American culture. I will spend a lot of time exploring NY city and visiting museums. AFAM: What is the advice you would give to those looking for an internship in the US? - A&M network is your best chance to find an internship. There are many alumni with high jobs in very big firms and they are always ready to help. Moreover, they can advise you and give you an intern feedback of the firm which can help you being more precise in your research and targeting the right people. - LinkedIn is the network where you can access HR profiles. If you have the nerves, try to contact them explaining what you are looking for and how you can help the firm. - One thing that people do not always think of is the placement organization. In my case, Parenthese proposed me their help to find an internship, and I’m sure they got plenty of resourceful relations ready to send your resume. - It is important to target important companies because they have more means than the small ones, especially regarding the visa. - If you are lucky, your parents can have friends with good jobs in the US that can help you too. - One more thing, it is necessary to apply to as much as possible firms you can. Try every lead that interests you and don’t give up if you have no response. AFAM: Thank you, Amaury, for this invaluable advice. 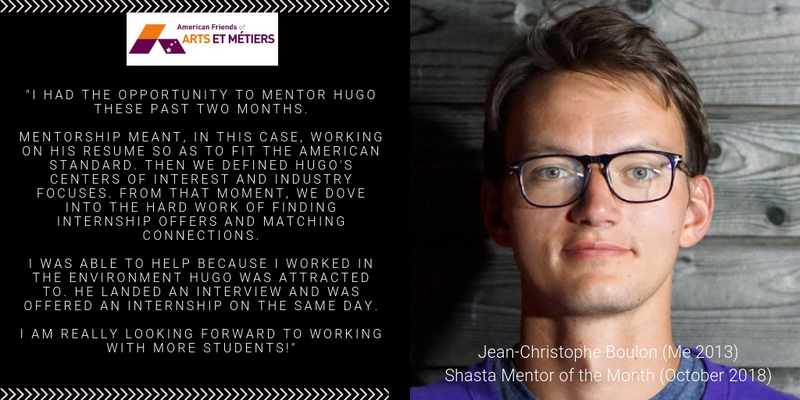 We would also add that those who are looking for an internship can contact AFAM directly to become a part of Shasta internship program. AFAM is also in partnership with Intern Abroad - a placement organization which might be helpful too during an internship search. AFAM: What are your hobbies, what do you do in your spare time? AMAURY: I spent a lot of time with the Scout’s movement, mostly for the human experience that I can have with youths and for all activities that we do together. I also love going on road trips to visit and discover new places! At this point, I visited the west coast of France and the North of Spain. I also have a lot of fun sailing and skiing (depending of the season). Otherwise, you can see me at Rock classes dancing and learning new movements or swimming sometimes. I recently discovered climbing and I appreciated it! I will certainly do it again in the US. AFAM: Thank you, Amaury, for sharing. We wish you a great internship and wonderful stay in NYC and we hope you will find an accomodation very soon! My name is Yann Orieult, I worked as a research assistant in the Human Systems Integration division at NASA Ames Research Center in Mountain View (California) from February to June 2016. Before that, I graduated with a master of science in October 2015 from the Polytechnic University of Madrid and with my engineering degree in February 2016 from the Arts & Métiers Paris Tech Engineering School. I have always been very interested in theoretical subjects. In 2015, to stick to my big interest in artificial intelligence and machine learning, I spent a long time thinking of the best way to enter this fabulous field. After several internships in these areas, I got a fantastic opportunity at NASA and was very motivated about the project even though there was no financing for me and life in California is very expensive.